Updated for 2019! The updated routine simplifies the workout considerably – a few exercises have been removed, and a couple new ones were added to optimize gains even more. You don’t need a gym membership to stay fit. Bodyweight exercises, together with proper sleep and diet, are enough to keep you healthy and strong. This is an effective and simple bodyweight workout that will get you building more muscle mass, cutting fat, improving flexibility, and turbocharging your mobility. If you follow the routine as outlined (and maintain a healthy diet), you will see visible results in 4-6 weeks. There are many variations of body-weight fitness routines out there – the following has been carefully put together by Reddit’s Bodyweight Fitness specialists (including academics and professional trainers). This workout should be done every other day (e.g. Monday, Wednesday, Friday, and so on.) This is so the body has enough time to recover in-between. On off-days, you can do cardio – go for a run. Make sure you sleep for at least 7 hours each night (at least 8 hours after a workout day). Try to eat healthy, balanced meals. Where possible, video links are provided for each exercise. Maintaining proper form is very important – if you can’t do an exercise without breaking form, don’t do it at all! Any time you see a progression (denoted by → sign), it means that you advance to the next exercise in each group once you’re able to do the full set of the previous. For example, once you’re able to do 3 sets of 8 inclined push-ups, you can move on to the full push-ups. Each time you work out, you only do the exercise for level you’re at. At minimum, you should be able to do 3 sets of 5 reps of an exercise (if not, go back to the previous level). Once you can do 3 x 5, aim for 3 x 6 during the next workout, and so on. Shoulder Band Warmup for 5-10 repetitions (reps). The Strength portion begins with one of the best exercises on the planet – the pull-up. Tip: don’t have a place to do pull-ups? No problem. Get a Pull-up bar and do them at home. Way cheaper than a gym membership! This entire routine should take you about 45-60 minutes to complete. Considering the immense benefits to your health and strength, I believe it’s worth it for everyone to find 60 minutes every other day to go through these exercises. Make this a habit and you’ll reap the benefits for life. Pro tip: don’t worry if you mess up the order of the exercises. 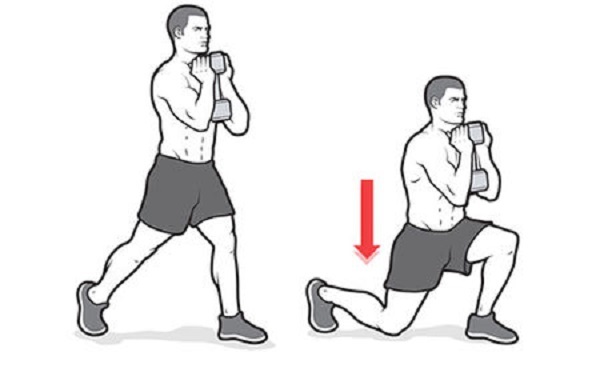 As long as you do the proper stretches before the Strength portion, you can mix up the order of the Strength pairs/triplet and it will be just fine. Next, to answer a Frequency Asked Question re: free weights. Proper form is critical with any kind of free weight work to avoid injury. Pictured: the Squat. 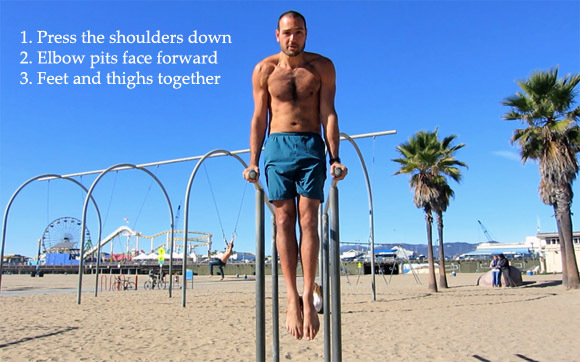 The only real “weakness” of the bodyweight routine – indeed, of any pure bodyweight routine – is the legwork. Simply put, you will likely speed up your gains by strategically integrating Squats and Deadlifts into the routine. Note: you will still make rapid and noticeable gains by sticking to 100% bodyweight exercises – this is just an optional addition for people who are willing to go the extra mile. Replace the Squat progression (1st Pair of Strength Exercises) with Barbell Squats (form is CRITICAL to prevent injury). Do 3 sets x 5 repetitions each workout. For every 1st and 3rd workout (e.g. every Monday and Friday), replace the Hinge progression with Romanian Deadlifts (3 x 8 reps). For every 2nd workout of the week (e.g. every Wednesday), replace the Hinge progression with Regular Deadlifts (3 x 8 reps). For all the barbell exercises, start with just the empty bar – then add a small amount of weight (5-10 lbs) with every workout. Summary: every week, you’ll be doing Squats three times, Romanian Deadlifts twice, and regular (stiff leg) deadlifts once. Please don’t blindly follow supplement advice from the Internet – everyone’s personal situation is different, and you’re better off consulting a specialist. As a general rule, supplements are taken to make up for a deficiency of something – and only you will know what exactly you’re lacking (e.g. vitamins, zinc, magnesium). According to the American College of Sports Medicine, you should take in 0.5-0.8 grams of protein per pound of body weight daily (1.2-1.7g per kg) to increase muscle mass. To simplify, someone weighing 170 lbs should be eating 85-140 grams of protein daily. I find it helpful to supplement my workouts with some good old protein shakes. The brand that’s generally recommended is Optimum Nutrition – they make a great protein isolate that’s aptly called the Gold Standard (my favorite flavor is the Extreme Milk Chocolate, but many others prefer the French Vanilla). Each scoop contains 24g of protein, perfect for post-workout. Amazon link. Protein shakes are great if you’re tired of eating nonstop chicken breasts – a quick shake of 2 scoops post-workout and you’re already at 48 grams of your recommended protein intake. Boom! If you find yourself plateauing for multiple weeks, it may be time to move on to the next level. 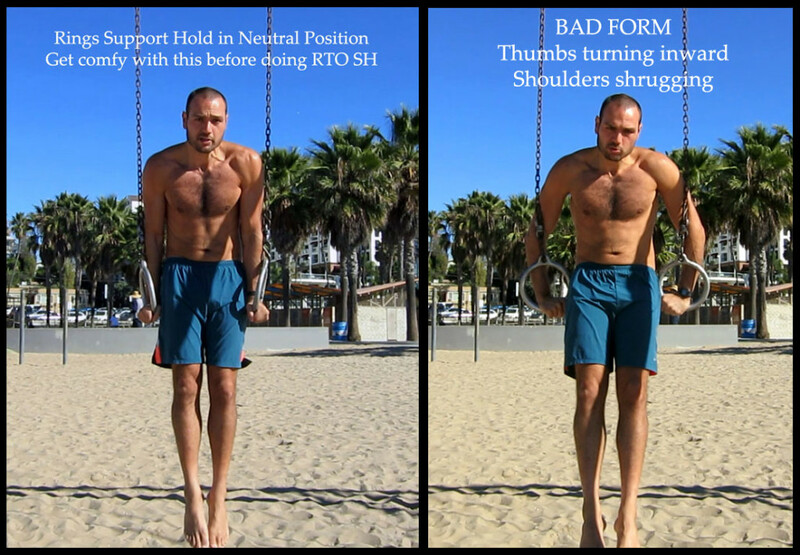 The Reddit community has also put together some advice for “Intermediate” bodyweight exercises. This article is so amazing, thank you for the efforts. Thanks, Oli! Good luck with your workouts. Excellent Tips. For those who cant afford gym memberships or weights equipment. Can I get this workout in a printable or downloadable? I don’t have anything like that – but if you make one, please feel free to share! what’s so hard to just copy paste the workout in a word / wordpad document, arrange it a bit and print 🙂 ? But then you really should show a picture of someone who doesn’t work out in a gym. Not the gym rat in your accompaning photo. This article is just awesome for fitness training.